What’s the first dessert that comes to mind when you think of summer? For me, it’s a s’more. Le’ts address the elephant in the room first. For all my life I’ve called it a s’mores. To be clear I thought it was like deer or moose. I thought s’mores was both singular and plural. Wikipedia has now corrected me. It’s a s’more (no “s” at the end). I learn something new everyday. 😉 If you’re my husband (the Pixar fan) then you may also refer to them as schmoes. Okay, back to your regularly scheduled program. Desserts. Summer desserts. How do you take your s’mores? I find that everyone has a specific way that they prefer to build their s’more. Do you use the extra large and in charge marshmallows or how about those fancy stackable ones? How much chocolate do you have oozing out of the graham sandwich? Maybe you go crazy and add a Reese’s peanut butter cup or chocolate hazelnut spread instead of a traditional chocolate bar. This inquiring mind wants to know. The marshmallows are puffy and pretty when you take the bars right out of the oven. However, they will settle down and look deflated once they’ve cooled. That’s reality. But they still taste dang good. My husband would like to point out that the graham flavor in these bars is not very strong. I did that intentionally because I think that the cookie part is supposed to take the place of the graham cracker. Grease a 9 x 13 inch pan and set it aside. I like to lay parchment paper in the pan so it is easier to remove the whole thing in one piece, but this is not required if you want to cut them straight out of the pan. In a medium bowl, whisk together the flour, baking soda, and salt. Set the dry ingredients aside. In a large bowl, cream the butter, white sugar, dark brown sugar, and vanilla extract. Gradually beat in the dry ingredients. Gently stir in the chocolate chips and crushed graham crackers. Spread the cookie dough in the prepared baking pan. Remove it from the oven, sprinkle the mini marshmallows on top then put it back in the oven to bake for an additional 9 to 13 minutes. If your marshmallows have not browned and you want them to have that golden “freshly toasted over a camp fire” color then switch your oven to broil mode. 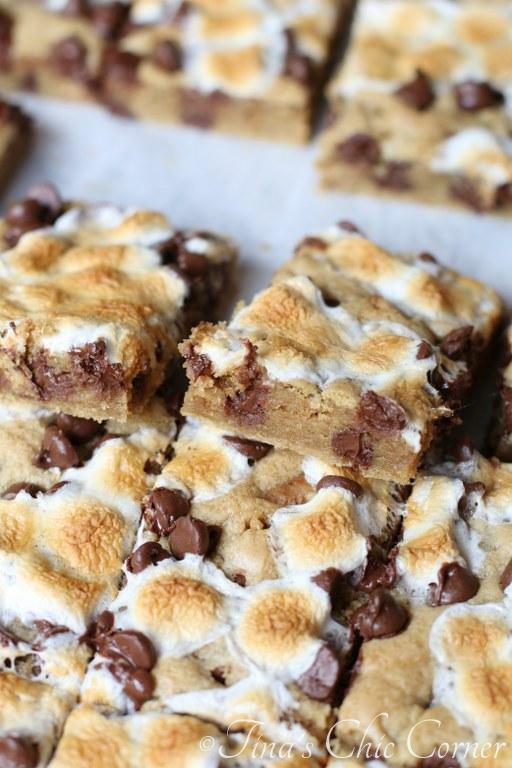 Keep the cookie bars in the oven for about 2 more minutes on broil, but keep a very close eye on it because once the marshmallows start toasting they will get dark very quickly and can easily burn by accident. Is the flour amount correct? 3-1/4 cups flours seems like an awful lot. Especially when it’s supposed to equal 13.7 ounces. Perhaps it was meant to be 1-3/4 cups? the measuring cup and then level it off with a butter knife. I was looking at the s’more recipe and it seems to be missing the ingredients to use and just has the increments for the first 8 ingredients. Can you please edit ?